An air hostess has fallen out of her plane inside an airport while preparing the flight for boarding. 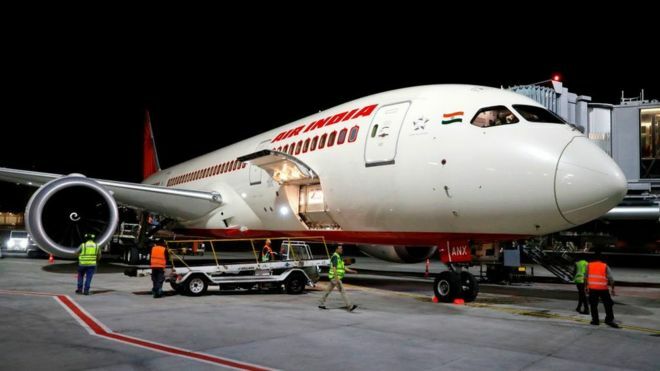 An Air India flight attendant has been injured after falling from the door of a parked aeroplane at India's Mumbai airport, BBC reports. Harsha Lobo was preparing the flight for boarding to Delhi on Monday morning when the incident happened. Ms Lobo, 52, suffered a fracture and other injuries and has been taken to a hospital. Air India, the country's national carrier, said in a statement that it was investigating the incident. "In an unfortunate incident, one of our cabin crew (members), Harsha Lobo, fell down on the tarmac from the Boeing-777 aircraft door while closing it," the airline said. Doctors attended to Ms Lobo at the Mumbai airport before sending her to the hospital. "She is conscious and well-oriented but has sustained compound (open) fracture of right lower leg bones and multiple blunt injuries," an airport official was quoted as saying by The Hindu newspaper. Last week, an Air India plane travelling from the southern Indian city of Trichy to Dubai sustained damage after hitting the airport wall during take off. The plane, which was carrying 130 passengers and six crew members, was diverted to Mumbai, where it landed safely. The incident came weeks after more than 30 passengers aboard an aircraft of Indian carrier Jet Airways had to receive treatment after pilots "forgot" to turn on a switch regulating cabin pressure.